Captain America: Civil War is a 2016 superhero film from Marvel Studios and is directed by Anthony Russo and Joe Russo. The film stars Marvel Comics character, Captain America. It is a direct sequel to the 2014 film, Captain America: The Winter Soldier (which was also directed by the Russo Brothers), and is also a follow-up to 2015’s Avengers: Age of Ultron. 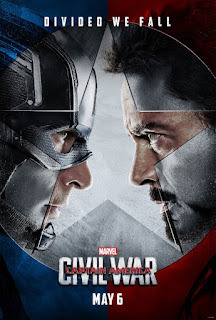 Civil War the movie finds the Avengers suddenly having to contend with political interference in the their activities, which causes a rift between teammates, Captain America and Iron Man. Early in Captain America: Civil War, Steve Rogers/Captain America (Chris Evans), Natasha Romanoff/Black Widow (Scarlett Johansson), Sam Wilson/The Falcon (Anthony Mackie), and Wanda Maximoff/Scarlet Witch (Elizabeth Olsen) travel to Lagos, Nigeria. There, they are on a mission to stop Hydra agent, Crossbones/Brock Rumlow (Frank Grillo), from stealing a biological weapon from a lab in Lagos. Just when the Avengers' mission seems successful, an unexpected, although not quite unavoidable, disaster occurs. In the aftermath, U.S. Secretary of State Thaddeus Ross (William Hurt) informs the Avengers that the United Nations wants to oversee and control the Avengers in the wake of the events of New York City (as seen in Marvel's The Avengers), Washington D.C. (depicted in Captain America: The Winter Soldier) and in the nation of Sokovia (shown in Avengers: Age of Ultron), as well as in Lagos. The United Nations is preparing to pass the “Sokovia Accords,” which will establish a UN panel to decide if and when the Avengers can go into action. Tony Stark/Iron Man (Robert Downey, Jr.) supports the accords, but Steve Rogers does not. I am not one of those people who believes that a movie is ruined for them if they read or hear “spoilers” about the contents of the movie. Before I saw the original Star Wars film, I had read the official novelization of the movie countless times, and I do mean countless. I was reading the thing about four or five times a year. When I finally saw Star Wars (two years after first seeing The Empire Strikes Back, I felt like I had experienced the story for the first time, although I had a fairly good idea about the film's course of events. Captain America: Civil War is the best superhero movie that I have every seen. It is the best film adaptation of a comic book that I have ever seen. I am loathe to spoil it for you, dear reader, but if you have ever seen a superhero movie, you owe it to yourself to see Captain America: Civil War. If you have seen a superhero movie from Pixar (The Incredibles), Warner Bros. Pictures (its numerous films based on DC Comics characters like Superman and Batman), Sony Pictures (its Spider-Man movies), Twentieth Century Fox (its movies based on Marvel Comics characters like the X-Men), or even one from Marvel Studios itself (the Iron Man and Avengers movies), then, you have to see Captain America: Civil War. You have too, dammit! It is now the gold standard for superhero movies. I think the secret to the success of Marvel Studios' movies involves several elements. Marvel movies have big action set pieces, and this one has enough to match the behemoth action scenes and sequences from both Avengers movies. Each movie has great character drama that involves some kind of conflict. It is not just man vs. man, man vs. himself, man vs. the world, or man vs. nature. It's man vs. man, man vs. himself, man vs. the world, AND man vs. nature. Most of all, the characters have engaging, cool, and even alluring personalities and personal stories. Whether it is Steve Rogers' man-out-of-time tale or Tony Stark's duel between his out-sized ego and his desire to be the man who uplifts the human race, Marvel characters work on a personal level. Steve Rogers and Tony Stark are just as amazing in or out of their costumes. Captain America: Civil War is not only good because it has a riveting plot and narrative. It is also good because Marvel Comics characters are simply great characters. With each Marvel Studios movie or movie featuring Marvel characters produced by other studios, the world is discovering what comic book fans already know. Go see Captain America: Civil War. It will probably end up being better than 90 percent of the films that receive Oscar nominations this year.